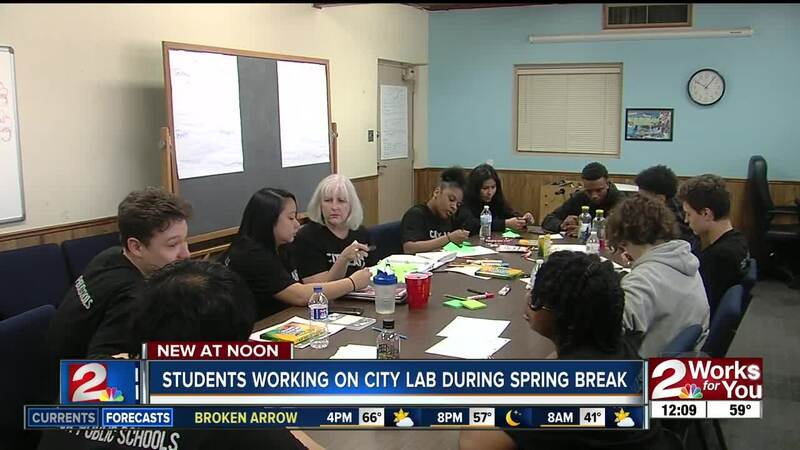 Tulsa Public Schools launched "City Lab" pilot program for high school students during spring break. The freshmen have to come up with a design proposal that will improve Reed Park Community Center in West Tulsa. TULSA, Okla. — Tulsa Public Schools (TPS) launched the "City Lab" pilot program on Monday to give students a hands-on opportunity at coming up with real-life solutions to improve a local park. A group of freshmen from Daniel Webster High School were chosen for the project and are spending their spring break designing a STEM-based learning display. The goal is to attract children ages four to 10 to the park and give them a chance to learn about the STEM fields: science, technology, engineering and math. The program is a partnership between City Year Tulsa , the Tulsa Regional STEM Alliance and the city's Parks and Recreation Department . It ends on Friday when the student participants will have to present their final proposal in front of stakeholders and Parks and Rec officials. Their design could be implemented at the park in the future. City Lab will have a longer program for high school students during the summer that will last 10 days.